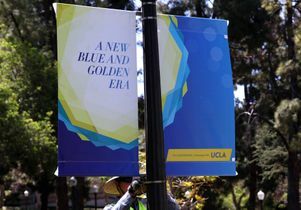 UCLA has kicked off the $4.2 billion Centennial Campaign for UCLA, the largest fundraising effort ever undertaken by a public university. Launched as UCLA counts down to 2019, the 100th anniversary of its founding, the campaign celebrates a century of growth and achievement as a top-tier university and seeks to secure the institution's future as a center for higher education where innovative teaching, groundbreaking research and dedicated service advance the public good. The campaign's slogan, "Let There Be" — inspired by the University of California motto "Let There Be Light" — invites partnerships that enhance UCLA's strengths and forge new paths. Chancellor Gene Block said The Centennial Campaign for UCLA asks supporters to dream, imagine and invest as UCLA poises to take on the challenges of its second century. "The history of UCLA is very much the history of Los Angeles," Block said. "As the city and region have developed, so has UCLA. During the past century, our campus has generated discoveries and programs that have helped change our city, state and world for the better. The Centennial Campaign for UCLA will help prepare us for our second century, creating new knowledge and embracing opportunities to transform lives and create a brighter future for all of us." In less than 100 years, UCLA has matured into one of the world's leading universities. UCLA competes with other leading universities — many of them private institutions with longer histories and much larger endowments — for the brightest students and most distinguished faculty. In this environment, ensuring long-term excellence requires that UCLA increase its endowment. Meanwhile, a long-term reduction in state support has dramatically changed how UCLA is funded, with state general fund appropriations now accounting for only 7 percent of revenues. The campaign will continue progress toward a more self-reliant funding model. Since the beginning of the campaign's private phase in July 2012, UCLA has raised $1.3 billion in cash and pledges, or 31 percent of the $4.2 billion goal. The campaign's co-chairs are Garen Staglin, a UCLA alumnus and private equity investor, and Anthony Pritzker, managing partner and co-founder of the Pritzker Group. Both are long-time donors who share a demonstrated commitment to improving society through investing in UCLA. Staglin and his wife, Shari, began supporting mental health research and treatment after their son was diagnosed with schizophrenia. In 2004 the Staglins, through their public nonprofit, the International Mental Health Research Organization, funded the Center for the Assessment and Prevention of Prodromal States, which identifies and treats adolescents and young adults at risk for developing psychotic disorders. They also funded the Staglin Center for Cognitive Neuroscience at UCLA, which opened in July 2010. The center brings together psychologists, psychiatrists, physicists, neurologists, mathematicians, linguists, electrical engineers and other scientists who study cognitive and emotional processes and how they affect our decision-making and mental health. Staglin said that the campaign will engage current UCLA students, faculty and alumni, as well as friends throughout California and around the world who recognize the ways UCLA enhances their lives. "The impact of UCLA's academic and scientific advances is felt far beyond our campus," said Staglin, whose family has endowed a professorship in psychology, psychiatry and biobehavioral sciences. "Our campaign goal is to reach out and engage as many people as possible who may be interested in supporting UCLA's world-class education and research efforts. UCLA accelerates cures for illness. UCLA invents devices that transform and save lives. UCLA develops scholars who advance learning across all academic disciplines. In short, giving to UCLA is ultimately an investment in building a better tomorrow." Pritzker is a member of the advisory board of the UCLA Institute of Environment and Sustainability and its founding chair. Over the years, the philanthropy of Pritzker and his wife, Jeanne, has been wide-ranging, including support not only for environmental research but also for UCLA student scholarships, the arts, medicine and athletics. Pritzker said the campaign will ensure UCLA's ability to continue to provide a top-quality, affordable education for students, while attracting the finest faculty and equipping them with the resources and facilities they need to thrive. 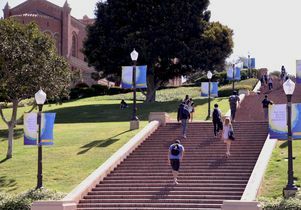 "UCLA has a unique commitment as a public institution to remain accessible to the best qualified students, regardless of their socioeconomic backgrounds," Pritzker said. "Nearly 80 percent of UCLA graduates live in California, directly benefiting the state as engineers, teachers, physicians, artists and scholars, among other professions. When they train here, they stay here, helping to power California's economic engine and demonstrating that investing in UCLA is investing in the state." 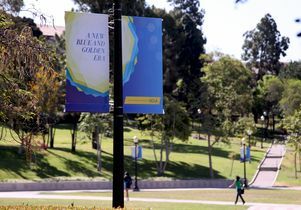 Banners go up on campus for The Centennial Campaign for UCLA.